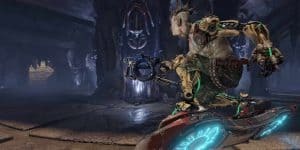 Quake Champions to be Free-to-Play, Pay If You Want | Nerd Much? Bethesda’s upcoming revival of the Quake franchise, Quake Champions, will essentially be a free-to-play game that also offers a buy once option. Creative director Tim Willits told Polygon in an interview that players who want to just play one character named Ranger can do so for free. Or, if they want to play as the rest of the champions at launch they can buy the Champion Pack. The Champion Pack will grant unlimited access to all of the champions available at launch for a fixed price — a price that is yet to be determined. According to Willits, this pay model is used to put the game in the most hands as possible, allowing those who just want to buy the game and be done with it the option to do so, while also offering a free-to-play option for those who might want to try it out and not pay anything. The unlocked characters will only be made available for a limited amount of time, although the price and length of time is still being discussed internally. However, the devs note that Favor is going to be easy to earn and trading it to unlock time with new champions will be frequent. Here’s to hoping that going free-to-play — which we all expected to be the case before the official announcement was made — doesn’t hinder Quake Champions‘ potential for success, as there’s undeniably a certain stigma that comes with throwing that term around. For now, Quake Champions is scheduled as a PC exclusive to be released later this year, and it’s one of our most anticipated games of 2017. What do you think? Is this free-to-play option a good move by Bethesda and id Software? Sound off in the comments below.